This side of my room is predominantly my Die – cutting area. My Most used machines are permanently out on the top with a box of cutting plates, embossing mats and other accessories at the side, along with guillotines and Go press & foil. Below the work top is where my other die cutting machines (used less often) live along with A3 and A4 card stock, and various ‘bit box’ baskets. The wall shelves above left house paper supplies Odds & Ends and Books, To the right they house the bulk of my die collection. Thin metal dies are stored on magnetic sheets in the clear boxes on the first shelf along with embossing folders. 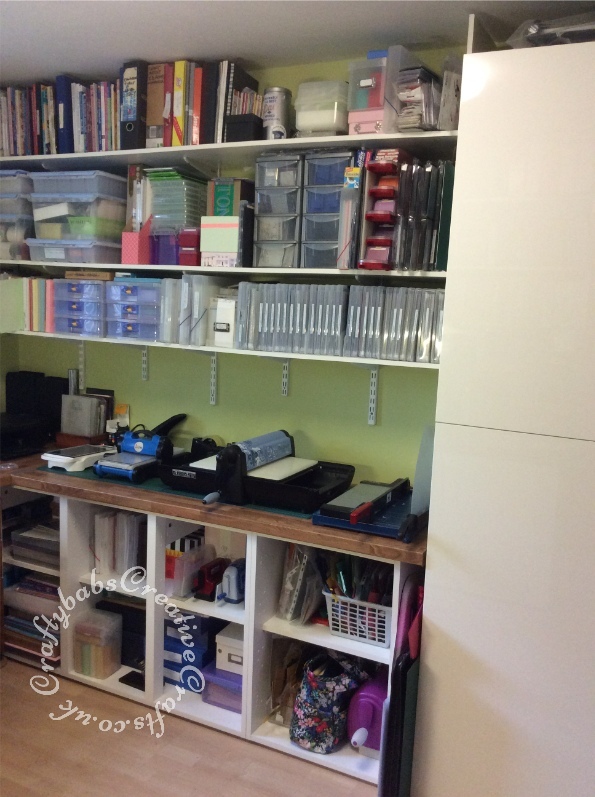 The next shelf holds Big shot Pro dies, large cutting plates, Sizzix Sizzlits alphebets sets and drawer units holding more alphabet dies of various brands. The top shel holds my 12″ sizzix, Spellbinders and Quickutz dies along with platforms and cutting plates plus more smaller dies.